All Year: Moving and renovating home and studio! October 9, 6 – 8 P.M.: The opening reception for “Out of the Ethers,” a solo exhibition at the New York Open Center, 22 East 30th Stree, New York, NY. Curated by Lola Shepard. October 9 – December 4: “Out of the Ethers,” a solo exhibition at the New York Open Center, New York, NY. Curated by Lola Shepard. Through March: “Squaring the Circle: Heaven in Earth” appears in the Winter issue of NY Spirit. March – June: “Infinite Life” appears on the back cover of the Spring issue of NY Spirit. January 24 – April 1: “Innovators and Legends: Generations in Textiles and Fiber” group show at Colorado State University, Fort Collins, CO. Curated by Geary Jones. March: Renee Phillips publishes “P.C. Turczyn Explains Her Healing Art” in the Celebrate the Healing Power of Art blog. April 12: Live painting at C.O.S.M., Wappingers Falls, NY. April 14: Karyn Meyer-Berthel publishes “Artist Spotlight: P.C.Turczyn” for the Dynasty Brush Blog. April 20 – October 30: “Quintessence: Three Visions” three person show with Janet Morgan and Alicia Hunsicker at the Ram Dass Library, The Omega Institute for Holistic Learning, Rhinebeck, NY. Curated by Amina Eagle. May: Nature photographer David Foster wins the Art That Supports the Healing Process Award. May 24 – September 7: “Innovators and Legends: Generations in Textiles and Fiber” group show at Figge Art Museum, Davenport, IA. Curated by Geary Jones. June – September: “Infinite Passion, Power & Purpose” appears on the front cover and inside page of the Summer issue of NY Spirit. June 29: Artist Talk at the Ram Dass Library, The Omega Institute, Rhinebeck, NY. June 29 – July 6: Artist-in-Residence at The Omega Institute for Holistic Studies, Rhinebeck, NY. September – December: “Infinite Patience” appears in the Autumn issue of NY Spirit. December: Selected for inclusion in Manhattan Arts International’s Artist Showcase program. December: “Infinite Creativity” appears in H.A.N.D.S., a free community newsletter for a complementary currency network in Golden Bay, New Zealand. January 29 – April 8, 2015: “Innovators and Legends: Generations in Textiles and Fiber” group show at 108 Contemporary, Tulsa, OK. Curated by Geary Jones. Through March 17, 2013: “Innovators and Legends: Generations in Textiles and Fibers” group show at the Muskegon Museum of Art, Muskegon, MI. Curated by Geary Jones. Through June, 2013: “Wishes and Dreams” group show at the Memorial Sloan-Kettering Cancer Care Brooklyn Infusion Center’s InFUSION Gallery, Brooklyn, NY. Curated by Molly Rottman. May – July: “Celebrate the Healing Power of Art” online group show. http://www.manhattanarts.com Curated by Jill Collins, Barbara Markoff and Renee Phillips. May 26 – August 11, 2013: “Innovators and Legends: Generations in Textiles and Fibers” group show at the Schweinfurth Memorial Art Center, Auburn, NY. Curated by Geary Jones. June 23: Artist talk at the Ram” Dass Library at the Omega Institute for Holistic Studies, Rhinebeck, NY. 8:30 P.M.
June 23 – 30: Artist-in-Residence at the Omega Institute for Holistic Studies, Rhinebeck, NY. September 8 – December: “Innovators and Legends: Generations in Textiles and Fiber” group show at University of Kentucky, Lexington, KY. Curated by Geary Jones. September – December: “Infinite Inspiration” is on the cover of New York Spirit. The online version features a breath awareness practice created by Gaye Abbott, inspired by the mandala. September – December: Elynne Rosenfeld profiles six artists, including P.C.Turczyn, in “Reiki Inspired Art” for William Rand’s Reiki News Magazine. “Infinite Health” and “Reiki: the Infinite Field” are reproduced. October – November: Renee Phillips writes about “The Virtues of Artistic Collaboration”, including comments from P.C.Turczyn, for Professional Artist Magazine. October: Release of Brooklyn Oenology’s 2011 Social Club Red Wine featuring P.C.Turczyn’s “Resonance” painting on the label, as part of an artist series of labels. October 29 – December 15: LIBATIONS, solo exhibition at Brooklyn Oenology Winery‘s Tasting Room, 209 Wythe Avenue in Williamsberg, Brooklyn. November 8, 7 – 11 P.M.: Opening reception for the solo exhibition at Brooklyn Oenology’s Tasting Room. 209 Wythe Avenue, Brooklyn. Poetry reading by Faybiene Miranda. December – March: “Squaring the Circle: Heaven in Earth” appears in the Winter issue of NY Spirit. January 24 – April 1, 2014: “Innovators and Legends: Generations in Textiles and Fiber” group show at Colorado State University, Fort Collins, CO. Curated by Geary Jones. May 24 – September 7, 2014: “Innovators and Legends: Generations in Textiles and Fiber” group show at Figge Art Museum, Davenport, IA. Curated by Geary Jones. All of 2012: “Revolution. Revelation. The 2012 annual edition of Planet Waves” by astrologer Eric Francis features 13 paintings by P.C.Turczyn. March/April: “PAMELA TURCZYN: Art in Support of Energy Healing” in Spirituality & Health, a five page, lushly illustrated article. March-June: The Park Slope Reader features “Infinite Surrender” on the cover of the Spring issue. Through August, 2012: “Comfort” group show at the inFUSION Gallery, Memorial Sloan-Kettering Cancer Care Brooklyn Infusion Center, 557 Atlantic Avenue, Brooklyn, NY. May 14 – July 14: “Infinite Creativity” presented with an Award of Excellence in “Celebrate the Healing Power of Art: Positive Art That Lifts the Spirit” at www.manhattanarts.com. Curated by Ed Rubin, Nancy Reyner and Renee Phillips. April 29 – June 22, 2012: “Persephone’s Jewels: Gifts from the Abyss” a solo exhibition of gilded paintings and archival digital prints at the Ram Dass Library, The Omega Institute for Holistic Studies, Rhinebeck, NY. June 3: Artist talk at the Ram Dass Library, The Omega Institute for Holistic Studies, Rhinebeck, NY. 8:30 P.M.
June – September: New York Spirit features “Infinite Creativity” on the cover of the Summer issue and “Unconditional Love” on the back cover. June – September: Park Slope Reader features “Big Top Mandala” on the cover of the Summer issue. 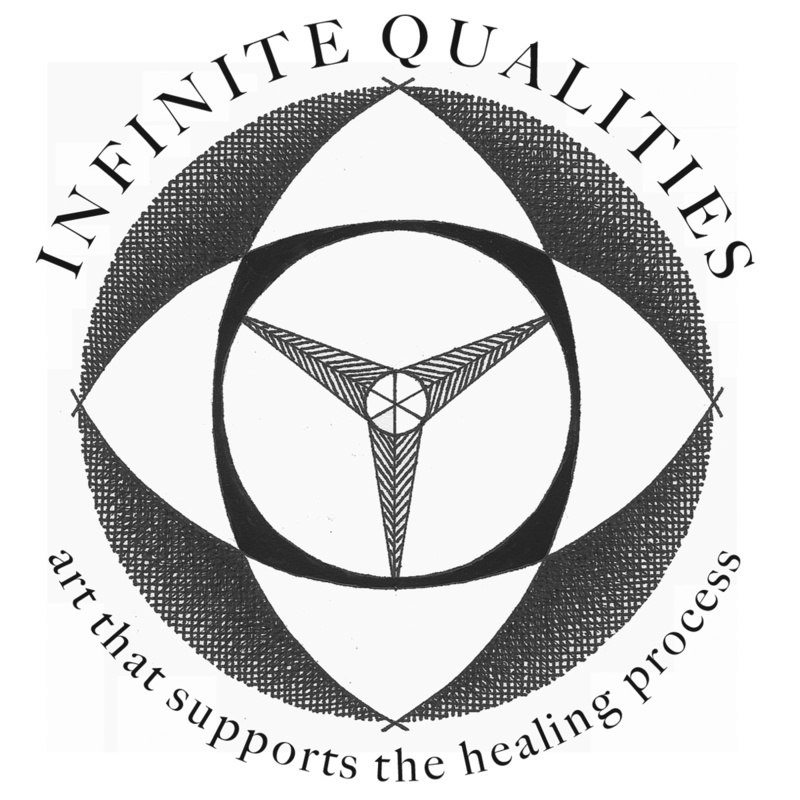 June 22 – October 31: “Infinite Qualities” a solo exhibition of archival digital prints at the Ram Dass Library, The Omega Institute for Holistic Studies, Rhinebeck, NY. July – August: “Infinite Creativity” appears in Professional Artist magazine: “22 Golden Rules for Saving Time” by Renee Phillips. September 21 – December 21: “Infinite Compassion” appears in New York Spirit with its accompanying meditation. September 2012 – August 2013: “Wishes and Dreams” group exhibition at the Memorial Sloan-Kettering Cancer Care Brooklyn Infusion Center’s InFUSION Gallery. December 13, 2012 – March 17, 2013: “Innovators and Legends: Generations in Textiles and Fibers” group show at the Muskegon Museum of Art, Muskegon, MI.